There has been a consistent demand for transparency and efficiency in public procurement. Towards that end, the Department of Expenditure (Ministry of Finance, Government of India) with technical support from the National Informatics Centre has developed a very effective eProcurement system. The initiative has recently been conferred upon the prestigious Gems of Digital India Award 2017 in the Analyst’s Choice category. In this post we bring to you the excerpts of an interview with Mr. K. Srinivasa Raghavan and Ms. Usha Saxena, the technology leaders behind the success of the eProcurement initiative. They share with Ankur Aggarwal how the eProcurement system has been constantly upgrading itself through the adoption of emerging technologies. Ankur: Please throw some light on the e-procurement initiative of the Government of India and the role of NIC. Mr. Raghavan: The eProcurement initiative of the Government aims at making public procurement simplified, transparent, and result-oriented. 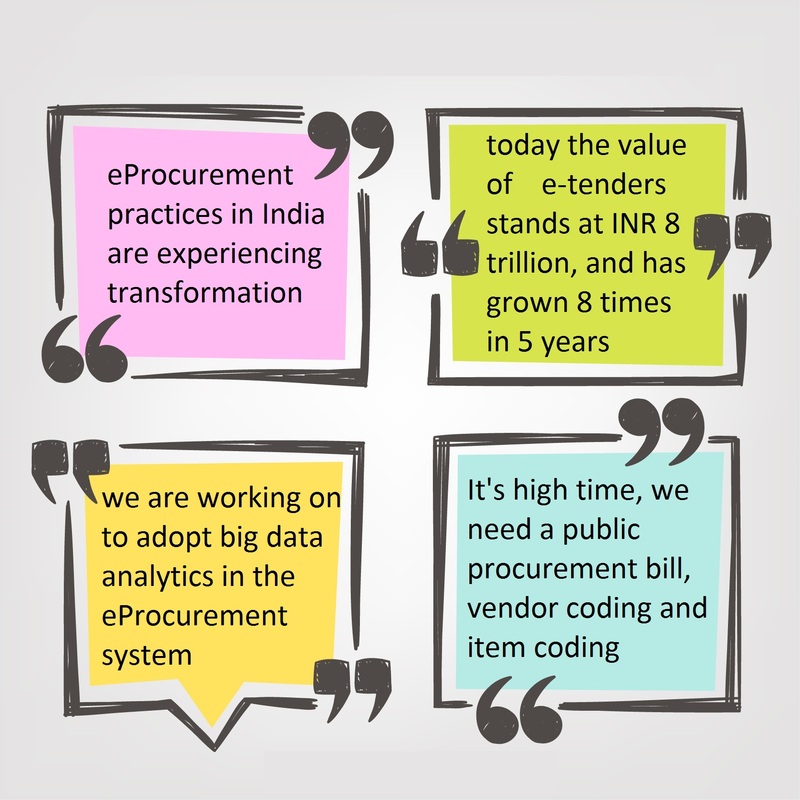 The eProcurement practices in India are experiencing transformation. Over the years, the eProcurement system in itself has evolved from being an information centric initiative to a transaction enabling platform. In the early 2000s, a need was felt to publish information electronically as all interested bidders could not avail the tender document. The information about tenders used to be restricted and to overcome this challenge, NIC created the portal www.tenders.gov.in. In the next phase during 2007-09, NIC created a Government eProcurement System (GePNIC) to facilitate transactions such as floating tenders and submitting bids online. The GePNIC is being implemented in 27 states/ UTs and about 350 Central Government institutions. Between FY 2012 and FY 2017, the number of e-tenders through the system has grown by 7 times while the value of transactions has grown by more than 8 times, which stands today at more than INR 8 trillion. There are 45 instances or the web interfaces of the application. 9 states/UTs are using other eProcurement systems. Another important role that NIC plays, in addition to developing the eProcurement system, is that of an integrator. NIC aggregates all the e-tenders of the country, from all 36 states/UTs, on a single portal (Central Public Procurement Portal). Ankur: Who are the key beneficiaries and how do they benefit? Ms. Saxena: The government procuring entities and the bidders are the major beneficiaries from the eProcurement system. The government entities benefit by way of active participation from more number of bidders which results in greater degree of competition in making supplies to the government. Better competition ultimately results into better prices and services. Adoption of eProcurement system has resulted into process transformation, which translates into simplification and standardization of the procurement processes across the government departments. There is an end-to-end automation of the bid life cycle processing. For the procuring government entities, the processes have become simple, fast and transparent. It has shortened the procurement cycle and enhanced transparency. The system generates dynamic reports, reduces litigations, complaints and RTIs. There is a concept of vendor portfolio which displays performance of participating organizations, end-to-end online bid life cycle processing etc. The business entities or bidders also draw multiple benefits from the eProcurement system, all of which translate into ease of doing business. They have a 24×7 access to a robust, fair, transparent and integrated system. 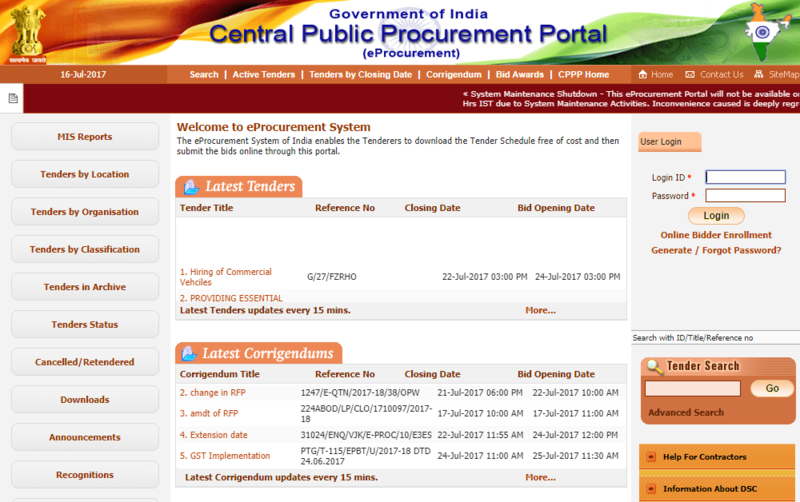 The tender information of all states/UTs and central government organizations across the country, is converged on a single platform – central public procurement portal (CPP Portal). Hence, all the e-tenders of the country are published on the CPP Portal. The tender synopsis is made available in public domain. The system offers a facility of SMS/e-mail/Mobile alerts to the bidders at various stages. This makes it even easier for the bidders to obtain information. They need not visit various portals very frequently. A registered bidder will receive an SMS or email notification whenever there is a new tender in the product/service category of her/his interest. They go one step further in providing information, by automatically sharing the information on all bids once the bids are open. Many business entities benefit from the concept of anonymity in bid submission. Even a new entity, which offers the best deal to the government, stands a chance to win the tender bid. Some procuring entities also offer the facility of making digital payments of the EMD, tender fee and the refunds happen automatically as per the business process. Ankur: How is the e-procurement system adopting emerging technologies? Mr. Raghavan: The last decade has witnessed huge transformation in the eProcurement system of the nation. A robust IT infrastructure, availability of better bandwidth, increased IT literacy amongst citizens, and most importantly political will of the top leadership have been the key driving forces behind this transformation. For making the eProcurement system more agile, we are adopting the emerging technologies such as mobility in cloud, big data, and data analytics. Each component brings efficiencies in the system in a different way. To implement an eProcurement system, a procuring entity need not go through process re-engineering or process automation at their end. They can simply onboard the Government eProcurement platform of NIC (GePNIC). The onboarding procedure can be completed in a day with the necessary inputs ready. GePNIC is provided to the stakeholders in SaaS (Software as a Service) model. The SaaS model brings efficiency by obviating the need to go through the process of setting up a dedicated instance, allocating backed infrastructure etc. We are also working on to adopt big data analytics in the eProcurement system. It would bring the necessary business insights and a great deal of efficiency in the procurement practices. An entity would be able to draw business insights and aid decision making, not only from its own data but also from the data of other similar entities. For instance, an educational institution floats a tender and suppose there are no bidders. The institution now will have to cancel this tender, conduct meetings to understand the causes, and float the tender again. This is a learning for the institution. With a data analytics tools in place, this learning can be shared with all. Other institutions facing a similar situation can leverage this knowledge to improve their decision making. A data analytics tool will aid decision making and bring efficiency in the public procurement in India. Ankur: Are the Government institutions ready to adopt data analytics, at least for procurement systems? Ms. Saxena: Several government institutions have already adopted data analytics for their institution specific data. These institutions are also offering the analytics in public domain in the form of dashboards. But the analytics in procurement systems are going to be more comprehensive and broader in nature. We intend to offer an aggregated analytics on the procurement data of all the Government institutions, whether using GePNIC or other procurement systems. This would really be a big data of all the 36 states/ UTs and about 350 central government institutions. Though all these institutions have digitized their procurement processes, a lot of efforts would be required to streamline the processes and make them analytics ready. All of them have their own set of terminologies, rules and procedures. There are two prerequisites for bringing congruence in the rules and procedures. One, policy intervention in the form of a Public Procurement Bill which has already been initiated. The bill would provide detailed guidelines on procurement. At present the tender process is guided by the GFR guidelines, which are very broad in nature. Two, codification of vendors and items would make the procurement data analytics ready. This will produce comparable data of procurement by all the Government institutions. It can be achieved with a coordinated efforts of the procuring entities. Ankur: Thank you very much for the insights. Your team is making strong contributions in realizing the dream of Digital India. Mr. Raghavan: You are most welcome, Ankur. I think Maximum Governance is a great initiative to share the knowledge within the government domain. I wish you all the best. Ms. Saxena: In fact, we have been regularly reading the maximum governance posts and gaining actionable insights about other digital initiatives of the government. I appreciate the fresh perspectives brought in. An instance is an exact replica of the GePNIC with a separate web interface. For example, www.uktenders.gov.in is an instance created for the state of Uttarakhand.